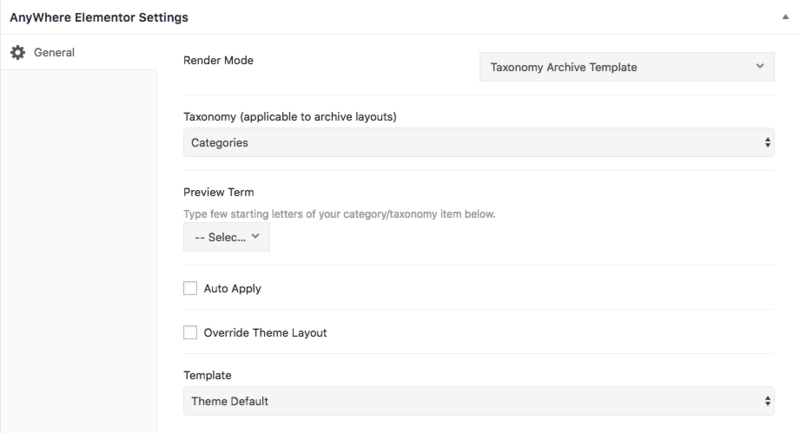 You can now create layouts for categories and custom taxonomy archive page with full freedom. Show posts in the list and grid format in any layout you want. Override Theme Layout: Check it if you are looking for a complete override of the theme provided layout. Leave it unchecked if you just want to override layout of individual post item. Template: Choose 'Theme Default', 'Elementor Canvas' and 'Elementor Full Width' from the option if you want to change the layout. Now save AE Template and start editing with Elementor. Configure the widget to show post from the category/term for which you are creating this layout. Now edit the category for which you have created this layout. On the category page, you will get a drop-down "Ae Template". Select the appropriate template from the drop-down.